Chris is delighted to announce that he’ll be performing in the hit Broadway show ‘The Illusionists’ at the Moon Palace Resort in Cancun, Mexico during the festive season this year. Find out more about Chris’ involvement with The Illusionists here. Palace Resorts is pleased to announce The Illusionists starring Chris Cox this winter at the brand’s signature property, AAA Four Diamond, Moon Palace Golf & Spa Resort. This incredible event will come to life at Cancun’s entertainment destination from December 22, 2015 through January 2, 2016. As seen on America’s Got Talent, Broadway’s holiday smash hit, The Illusionists, is a fast-paced, wildly entertaining show, featuring seven of the world’s greatest magicians. This critically acclaimed production has shattered box office records across the globe and stunned thousands with some of the most outrageous and miraculous acts ever to be seen on stage. 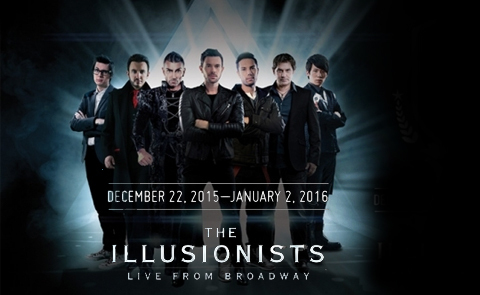 The Illusionists is sure to dazzle audiences of all ages. Chris Cox’s Mind Boggling Magic – Chris’ Brand New BBC TV Show!